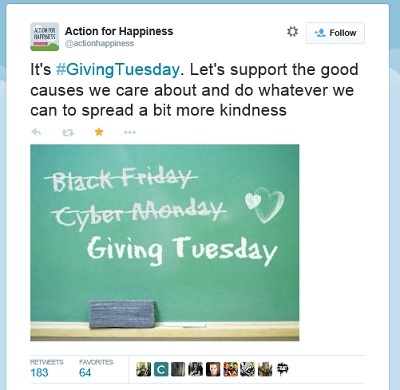 On Tuesday 2nd December my timeline was filled with all sorts of messages tagged with #GivingTuesday. It was brilliant to see Twitter awash with fundraising, volunteering, other asks and thank you’s. Many were simple, others were moving or creative. If you missed it all, there are two great Storifys packed with examples. Tennyson Insurance and GivingTuesdayUK have both curated some of the social media activity around the event. If you missed all the hype about the event you can read the background about it on the GivingTuesdayUK website. It’s really interesting to look at the different ways organisations used the day to spread their message. Many used it as a chance to try something new and creative. Organisations used powerful images, videos and storytelling to share their message. There were thousands of #UNselfies. RNIB’s #PassTheParcel stood out as a fun game using sefies and tagging. And Sue Ryder used Buzzfeed to promote their Secret Santa. This great UKFundraising’s article on 6 ways charities made the most of Giving Tuesday looks at some of the trends. And this Storify from Project Scotland shows all the activity around their own campaign. The day that followed was tagged #ThankYouWednesday. It was the first step to building a longer relationships with new supporters. Many charities (but fewer than those who embraced #GivingTuesday) shared a simple thank you and welcomed new followers / donors / volunteers / emailnewsletter subscribers. Here’s a Giving Tuesday UK Storify of the thank you’s. Hopefully people will reflect on the day and in time share data about the impact of the event. The Twitter graphs and Twitter analysis by Crimson Hexagon show that there was a lot of noise about the event – 30,000 UK tweets. It remains to be seen how this translated into donations of money, time and action. Civil Society’s article cites healthy percentage increases in donations via JustGiving, JustTextGiving and Visa. Hopefully positive results from individual charities will inspire those who didn’t get involved yesterday, to join in in 2015. WOW – just heard we took almost 1000 online donations throughout #GivingTuesday yesterday, huge thank you to each & every one of you! If you did join in this year, what will you do differently / better next year? What will you build in to your everyday communications as a result of taking risks this year? What skills or resources do you need to develop a stronger ask? There are lots of useful guides, courses and conferences to give you inspiration. In particular, don’t miss the Social Media Exchange in February. Did you donate yesterday? Do you think #GivingTuesday is a good idea? Did it make a difference to your charity?